Fall Daffodils (Sternbergia lutea): growing, planting, caring. Sternbergia lutea, known as the winter daffodil, autumn daffodil, fall daffodil, lily-of-the-field, or yellow autumn crocus, is a bulbous flowering plant in the family Amaryllidaceae, used as an ornamental plant. It is not a real crocus ... but it really blooms in autumn, usually in bright undergrowth, rocks or even pots. Crocus, or Sternbergia are bulbous perennials with yellow or white autumnal flowers, with 6 tepals. In short, they look like crocus flowers! The leaves are deciduous and basal, erect and elongated. Place them in well-drained, moderately humid soil, in shade or partial shade. 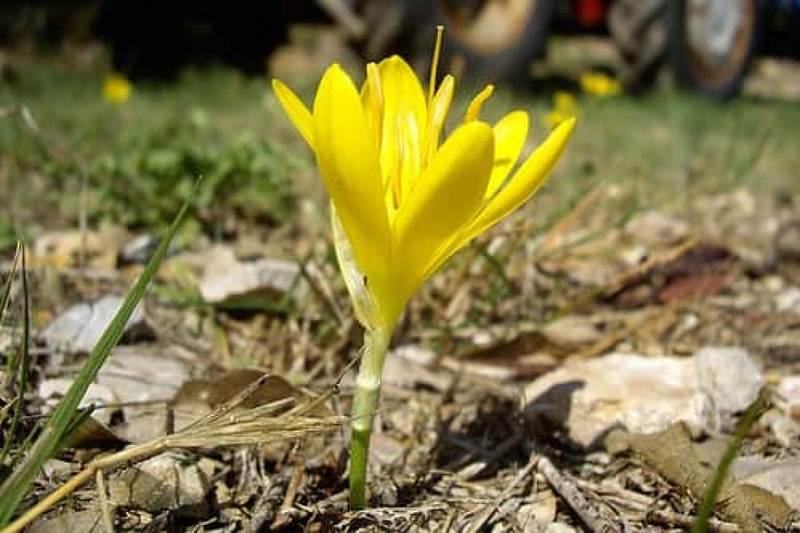 Be careful, Sternbergia can not stand wet and cold winters. Plant in a well-drained soil, moderately moist, in the shade or half shade. Push each bulb by hand a few inches deep, keeping the tip up. Water once to soak the earth. In pots, plant in a mixture of sand, loam and potting soil. Place the pot in the light without sticking it to a window. During growth, water your bulbs regularly to keep the soil always slightly damp. Stop adding as soon as the leaves wither. If your winters are cold and wet, remove your bulbs from the soil, let them dry for a few days on a rack, and store them dry and out of the light until the following May. If you have sheltered your bulbs for the winter, in May you can replant them. Plant in a well-drained soil, moderately moist, in the shade or semi-shade, simply worked on a few centimeters. Push each bulb by hand a few inches, keeping the tip up. Water once to "sink" the soil. Sternbergia is especially afraid of cold winters and sunny summers. If yours are not healthy, this is the first explanation. Every three years, repot your autumn crocus in a new mix of sand, ripe compost and loam. Do not discard the old mixture: a little journey in the compost and it will be useful again.